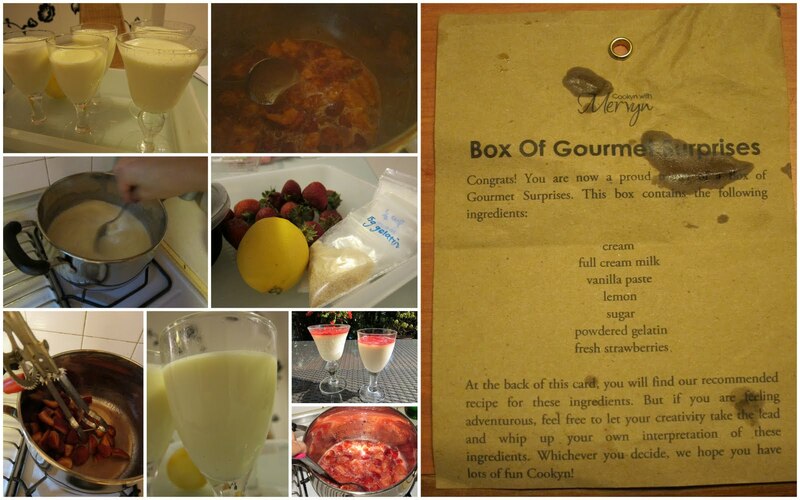 Amanda from Cookyn with Mervyn emailed me last week asking where she could deliver a special package for me. The only hint she would give me is that it was something pretty. Now, who am I to turn down anything pretty or edible? 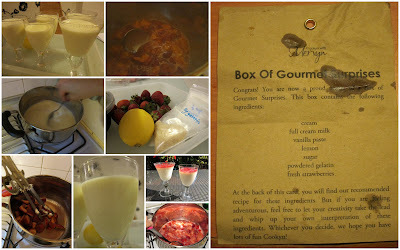 Cookyn with Mervyn delivered a "Box of Gourmet Surprises" and suggested a Panna cotta recipe. Seeing how I've never made panna cotta before and was short on time (panna cotta basics are pretty easy), I eagerly threw it together before heading to TAB to watch that night's performances. I borrowed my friend's kitchen, but couldn't find a blender, so chunky strawberry coulis had to make do. The results? In a pot, gently simmer ingredients for strawberry coulis. Remove from heat immediately and blend with a hand held blender. Set aside to cool and refrigerate. Simmer cream, milk, vanilla paste, sugar and lemon (do not let it boil). Remove from heat. Soften the gelatin powder with a little cold water. Add the soft gelatin into the cream mixture and stir till well incorporated. Sieve the mixture into cups or ramekins. Refrigerate once cooled for at least 4 hours. Top with the strawberry coulis before serving. Thanks Mervyn and Amanda! Visit their site for more information on their private or group cooking classes at Cookyn Inc.
See here for previous entries about Cookyn with Mervyn.